Last year, I thought about how cool it would be to work on this project for Amazon, Fedex, UPS, etc. UPS has completed the first test of its truck-launched HorseFly delivery drones. Conducted in a small suburb of Tampa, Florida, a modified UPS truck launched a drone that delivered a package and then returned to the truck as it continued to drive along its route. 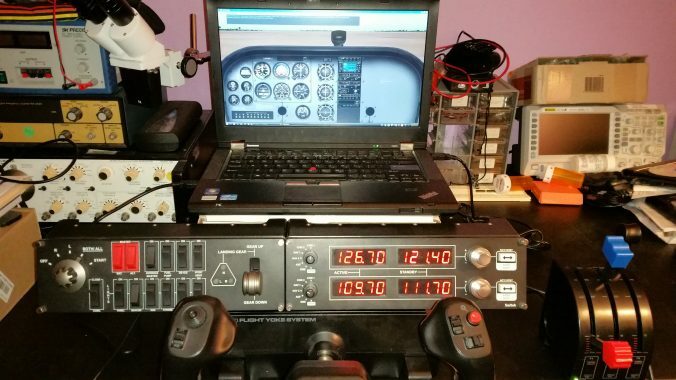 This is my flight simulator setup that I put together a few years back. Given the plane+instructor cost, this setup paid itself many many times. Best part is you can position the plane for what you want to practice, save it as a scenario, and then fly it a zillion times, without wasting time+money for taking off, making a turn, calling the tower in real plane. This is the only video in youtube that actually explains how slips work and what to do if you are not lined up with the runway. This plus 2 hours on the simulator, I think I’m ready to try slips again. Late December 2016, Mats told me we would start traffic pattern work. In other words, we take off, turn around the runway and then land. Repeat, rinse. In the short time between take off and touch-down, I had to deal w/ a lot of controls, radio communication w/ tower, as well as monitoring outside for other planes, glancing at instruments, and of course flying the plane into the final leg, work on holding the plane lined up with the runway (one arm on yoke, one arm on the throttle, legs on the rudder). I felt like a monkey each time. It turns out we did 16 or 20 landings in 2 hours. No wonder I was exhausted afterwards. Fast forward a few weeks, I have about 70 landings by the end of February. The weather was rainy in Jan/Feb so we had to skip a few lessons. The problem with skipping is I forget some stuff and have to relearn. My last flight (mid Feb) was a windy day. First 45 minutes, I always ended up short on final and was wondering what I was doing wrong. Then we realized (we meaning me, Mats knew what was going on but he has started to keep quiet in lessons to get me ready for solos), I realized there was a strong head wind so I was coming down fast. Once I figured this, I adjusted my glide path accordingly and started to reach the runway numbers. I still had a problem with the gusty winds during flare so I can’t say I am ready for solo yet. Mats told me we had approximately 20 knots headwind in the air and 10 knots headwind on the ground. As I said earlier, I noticed Mats started to keep quiet during the flights, letting me do the whole thing from taxi to landing and taxiing back to the hangar, including mistakes and recovering from them. This coincided w/ the time I decided not to depend on him anymore to get ready for solo. I now ask the ATC to repeat if I don’t get what they want instead of looking at Mats. By the way, I forgot to tell you I am learning in a Cessna 152. I started with Cessna 172 but I switched to 152 because it was $20 cheaper and I like the simplicity of 152.